When clients said they wanted more versatility and affordability in the helicopters they use for offshore oil and gas activities, Bristow listened. We worked closely with AgustaWestland throughout the development of the AW189, and the end result is a superb aircraft built to the most advanced technical specifications and state-of-the-art safety technology. 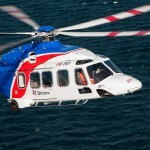 As the launch customer, Bristow is proud to be able to provide our clients with the first experience aboard the AW189. Those first eight passengers heading into the North Sea noticed the standout features of the AW189 immediately when they walked beneath the high-clearance main rotor and stepped into the largest helicopter cabin in its class. Once under way, they enjoyed a ride that now features lower vibration and reduced noise levels. While looking out the large cabin windows, they could see there are big sliding doors at each row for fast entry and exit. On their tour of the cockpit, they saw the top-shelf avionics that enable pilots to fly day and night in all weather conditions while reducing their workloads and offering maximum situational awareness. Bristow currently has two AW189 helicopters based in Norwich, England, but we’re just getting started. Four more AW189s are on their way, and once they’re delivered, we’ll have more than 120 large helicopters in our fleet.